I invite you to join me for this special Best Offer Blog Auction in collaboration with True Colors: A Group Show by Pet Friendly Artists on exhibit at the Yummy Wine Bar & Bistro in Seaside, OR. 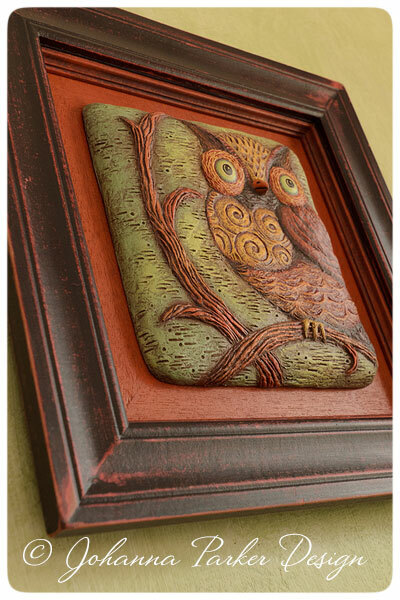 Bids will be collected privately via EMAIL, and the winner of “Watchful Owlfredo” will enjoy my collectible, original Artscape along with the honor of aiding abandoned pets. Clatsop Animal Assistance is a nonprofit organization in Oregon that shelters and cares for homeless cats and dogs. * 100% of the sale of this piece will benefit this non-profit organization. * A tax deductible receipt will be provided to the new owner of this special, 1/1 art piece. Auction has now ended. Thank you! 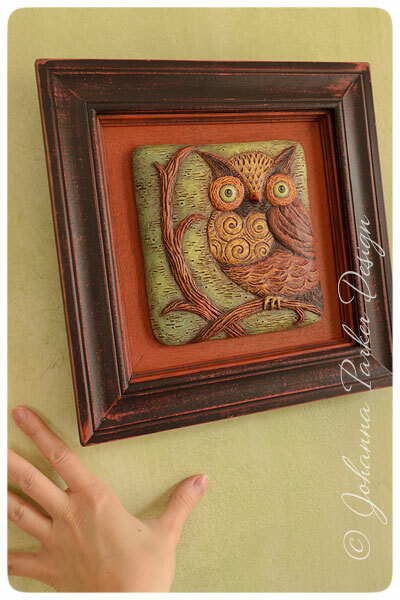 "Watchful Owlfredo" was born from a long-standing vision I have had to create dimensional Artscapes from papier mache and repurposed frames. 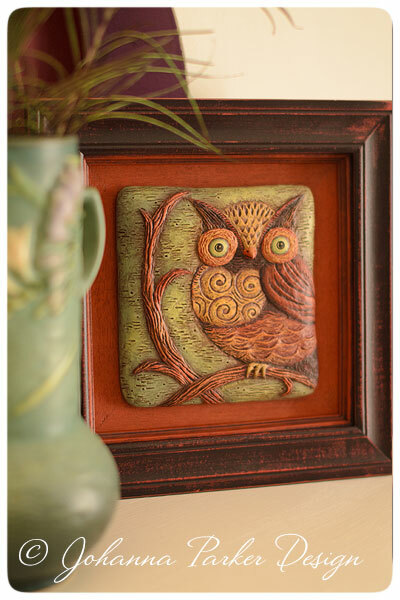 A first of its kind, the focal image is hand-sculpted and intricately detailed with textural touches through a layering process of many steps. A medley of painted hues are applied to create more depth and interest. The detail is a challenge to capture through photography, so a viewing in person is truly preferred. But, as this an online Best Offer Blog Auction, I will attempt to describe it further! Vintage hues of soft green and turquoise create a lovely backdrop, while undertones of plum-brown fill the textural patterns that break up the space. A deep plum color fills the crevices of the twisting branches which are highlighted in pumpkin orange. 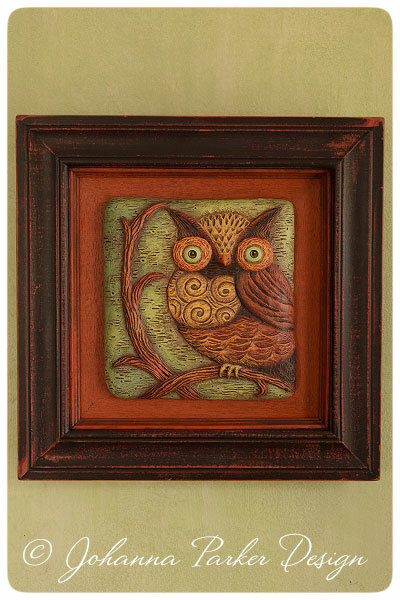 The owl also carries the rich plum hue in his recessed details. Butter yellow and harvest orange highlight his stylized feathers. 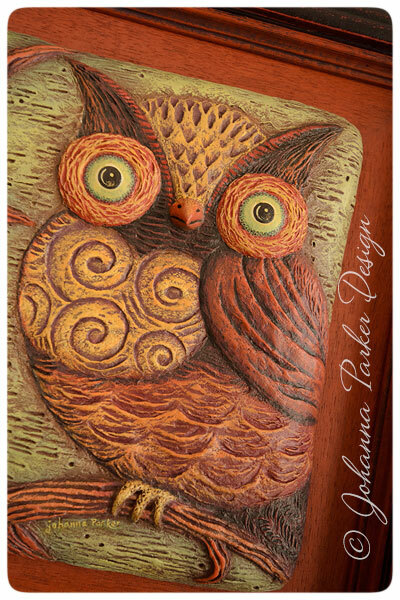 The beak, the eyes, chest and talons project dimensionally along with the stylized branches that frame this whimsical character. The modified outer frame is under-painted in terracotta with a deep plum-black top coat. JP applied additional trim to create more depth and stability. He also added the backboard which is terracotta-washed mahogany veneer. 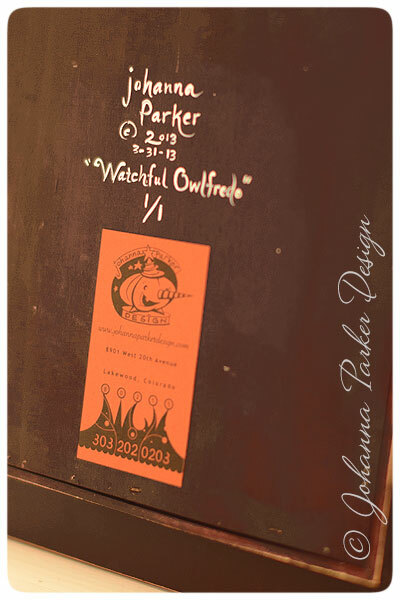 Signed and dated by me, Johanna Parker, this is a unique first-of / one of a kind Artscape piece. Please scroll down for details about this auction and images of this unique framed art. If you would like to be the proud owner of "Watchful Owlfredo,"simply EMAIL ME with your Best Offer. What would you be willing to DONATE to the Clatsop Animal Assistance AND adopt this collectible piece? On Sunday, July 7th at 9:30 pm EST, I will email all the participating bidders with a Last Call, announcing the current high offer. Afterwards, bidders will have until mid-day on July 8th to submit any additional offers. I hope to announce the Winning Offer amount here on my blog by 1pm EST on the 8th. So, you have about a week's time to submit your best offer/s. Anyone has a chance to participate if he or she chooses, and bidders can keep track of the approximated offers here on my blog. Please study the various photos below to see if you would like to adopt "Watchful Owlfredo." In April, I shipped this piece off to my artist friend Jimmy Pickering, who asked me to donate art to his partner's benefit. 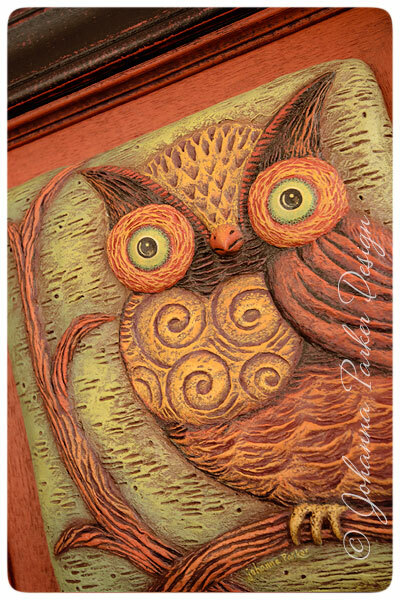 Watchful Owlfredo has been hanging in the Gallery at the Yummy Wine Bar & Bistro in Seaside, Oregon for over 2 months, and I wish I could have been there to see the rest of the show! I promised that I would not release this piece until I hosted a special Blog Auction, and the time is now. Before I shipped this first Artscape of mine, we hung it on our living room wall, stepped back and smiled! As difficult as it was to let him go, we knew he will help nurture homeless cats and dogs, and that feels good! We hope you will join us in making this donation count! * Photos truly do not do this piece justice, but all I can say is that I know you will be happy with your donation in the event you share the best offer. Spread the word and THANK YOU for your donation of support!